teething | everything will turn out alright. sylvie has been teething for quite some time now. however, we’re still waiting for her first tooth to show itself. in the meantime, we’re handling it with the help of various teethers, hyland’s teething gel, and the occasional bedtime dose of infant tylenol. today we added a new item to our lineup–homemade teething biscuits. 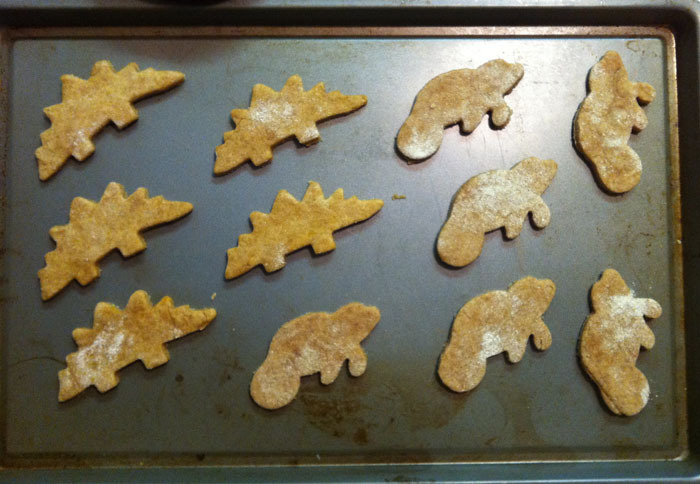 the stegosauruses (i totally had to look up the plural of that word) are sweet curry and the manatees are cinnamon vanilla flavored. they were so incredibly easy to make. 2 in a medium bowl mix together flour, rice cereal, and flavoring. 3. slowly stir in the canola oil. 4. add the ice water 1 tablespoon at a time until the dough forms into a ball (it took about 6-7 tablespoons for me). 5. dust your work surface with flour and knead the dough a few times to toughen it up. 6. flour your rolling pin and roll out the dough until it’s 1/2 inch thick. 7. cut into shapes and place on an ungreased cookie sheet. 8. bake for 10-12 minutes or until lightly browned. this recipe makes approximately 6 biscuits. leave them out overnight to harden. they will keep in an airtight container for 2 weeks. i just made them tonight, so we’ll have to wait until tomorrow to test one. i tasted the dough and it wasn’t too bad. i’m also going to try freezing half of a banana for her to gum on. i hope these teeth start to break through soon! on the other hand, i’m going to miss her gummy smile. watching her grow is so bittersweet sometimes. This entry was posted in Uncategorized and tagged 5 months, teething. Bookmark the permalink. It always seems like it takes forever for teeth to come through. Baby will drool and drool and finally the teeth come in! I think Evangeline was getting all four molars + all 4 incisors during Christmas when y’all were here. I could see the tiny holes where they had just poked through. They are just now in far enough to see the very tip tops of them. Hope Sylvie enjoys her teething biscuits! Poor little E! That’s so many teeth all at once! Can’t wait to hear how she likes the biscuits. I might have to try that for Olive. We have quite the arsenal of toys as well but I have no idea if anything actually works. Teething is so brutal…..
I’m curious about how she’ll do with the biscuits as well. I’ll report back! Teething is such a bummer! I’m making this right now! Such a good idea! Mason is getting four teeth in on the top and I know he’ll love this! If they turn out good I’m going to bake a bunch for his birthday party this weekend and give them in a favor bag! That’s a great idea! Sylvie seemed to like them, though she doesn’t like to hold the same thing for very long. She’s always moving onto something else! I thought it was so cruel how long it would take for her teeth to cut through. Poor little Sylvie. I can’t wait to hear how she likes those adorable teething biscuits. I’ll have to save the recipe in case we have another little one. Sylvie is a drool factory. Most of the time we just ignore it. We bib her if she’s wearing a particularly cute outfit. She’s been actively teething for over a month and there’s still no sign of anything poking through. Ugh! Come on, teefers! Awe Sylvie! I hope the teething isn’t too bothersome. 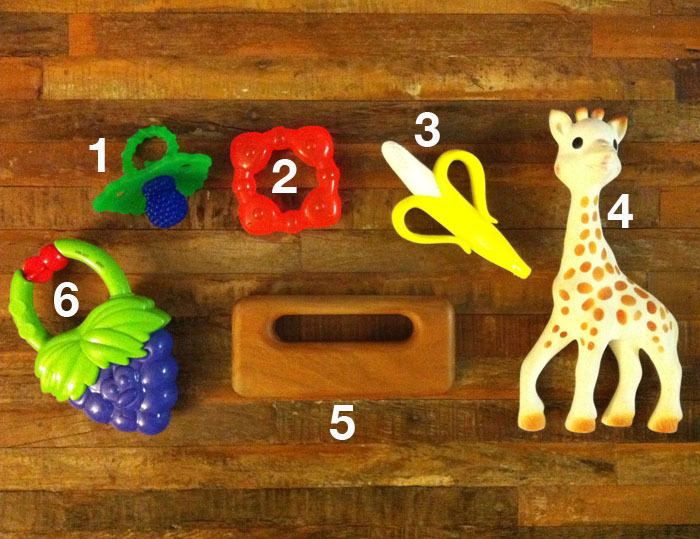 I am so glad that she loves the wood teether! I’ve heard that frozen bananas work as well- and there is always whiskey! Haha- that is what my parents used and I blame them for my love of whiskey today. I think it is so neat that you are making those teething biscuits- I also think that it is so very wonderful that you are introducing different tastes this early. You and Travis are just the coolest.